It’s five o’clock in the morning, Saturday July 7, and the whole of London is gearing up for the greatest cycling event the nation has seen: the prologue of the 2007 Tour de France. It’s the stuff dreams are made of, to see the world’s best riders hurtling round the streets of a great city, the city that’s been my home for 12 years. So what am I doing 1,850 metres up a mountain in the Alps? Getting my revenge is what I’m doing. I’ve waited 364 days for this. Riding La Marmotte was a major goal last year but 48 hours prior to the event, while travelling there I got food poisoning — gutted. So when the date for this year’s ride was announced it threw up the mother of all calendar clashes. I had a big decision to make and I made my choice on the likelihood of either scenario being repeated. Ultimately, at 35, my slim chances of ever being this fit for La Marmotte again meant it won out. I had left my entry late and following a misunderstanding of the online form I had managed to enter myself as a ‘Randonneur’. This gave me a poor start number of 4859, which I hoped wouldn’t make much difference, as I assumed I would be riding at my own pace wherever I was. and my legs were far from fresh, but at least I was healthy. I funnelled through the bottleneck start area in Bourg d’Oisans and the ride began. I had a fair idea of how I was going to ride La Marmotte — by sucking wheels on the flat, conserving energy while keeping a good speed, then make my efforts on the climbs. I rolled along and waited for someone riding quicker to pass me, and sure enough they did. I jumped on the back of three Spaniards in matching club kit; they looked keen and were happy to ride at a good pace so I figured I’d ride this train to the base of the Col du Glandon. As we charged along the left hand side of the road devouring all in front, the group grew until we numbered about 30. When we hit the climb though, ‘boom’ — the group instantly fragmented. Some fell back, others went forward. The Glandon is 24km long so I sat behind the Spaniards to see what pace they set. I had climbed a few mountains before, as had my bike, so apart from fitting some very nice tyres, I changed nothing. I stuck with my regular 53/39 chainrings with a 13-25 cassette on the back. I was confident I wouldn’t use the 25 — that was just for emergencies. A few kilometres up and the Spaniards started to flounder, so I upped the pace. The advantage of starting with the randonneurs was that I always had someone to pass and I was riding comfortably quicker than all those around me. I lacked a little souplesse due to the time spent in the car on the way down but I found a pace I could sustain without discomfort. Although La Marmotte is a mass participation ride, with close to 6,000 competitors, it is, in a way, quite a lonely event. Whether you start with or without club-mates the chances of them climbing at your speed is very slim so you will probably spend the majority of your day alone. With 10km to the summit I was finally passed by another rider, so I upped my tempo and got on his wheel — he was pretty fast. I could hold his pace, but it was just that bit quicker than was comfortable. The finish was still a very long way to go so I was forced to back off, and as if failing to land a big fish, I cut the line and released him into the ocean of riders. I reached the top of the Glandon, refilled the bottle I’d drunk, had my picture taken, put on my gilet and headed straight down the other side. At first the descent is twisty and dangerous but it soon unwinds, giving you a chance to stretch your legs and relax. I was riding fairly cautiously and a number of the riders I’d picked off heading upwards were now passing me. The descent finally reached Montarlot and I knew ahead was the long, flat part of the ride so I did as I had done at the start and latched onto some fast wheels and sat there. Already quite hungry, I ate two of the three sandwiches I had in my pocket while riding. Although my legs felt worse than I would have liked, the food made me feel better. For the next 40km the group I was in rode quickly, swallowing other groups, taking the riders it wanted and spitting the rest out the back. The group’s composition was in constant flux and any lapse in concentration would see me stranded behind a slower rider and having to jump the gap to get back into the main group. This forced me to break my rule by making an effort on the flat, but it was obligatory if I was to stay on course for a good time. I arrived at the base of the Col du Télégraphe, the least formidable ascent of the four giant climbs. I rode this climb well — I sat on my 39×23 and felt better than I did up the Glandon. I reached the top feeling strong, but at the same time hungry again. I assumed there would be a feed in Valloire in the dip between the Télégraphe and the Galiber so I would refuel there. I reached Valloire and there was nothing. Suddenly, out of nowhere I was empty, I needed food. My mind had told my body it could refuel in Valloire which my body was happy about, but on discovering there was nothing available, my body became very angry and I started to feel bad. Leaving Valloire I saw the sign, ‘Feed 3km’. That was one of the longest 3km of the ride and almost certainly the low point. Once there, I furiously gorged myself on cake and orange segments before filling my bottles and setting off to tackle the mighty Galibier. I’ve ridden this climb four times over the years and I knew I could do it well. Trouble was, I’d never arrived at the Galibier with two climbs and 100km already in my legs. The first half of the climb is reasonably tame but, following a switchback, it ramps up skyward like a plane taking off. Previously I’d attacked this incline but today it attacked me and I was forced to turn to my emergency 25 sprocket. Up until now I’d kept it in the bank, my safety net. I begrudgingly clicked down, knowing this was the last card I could play and thankfully once again found a comfortable pace. By now some of the riders were in trouble and the side of the road was becoming littered with bodies. I just tried to convince myself that once over the Galibier I was basically home — it was just 45km downhill; then 13.5 up Alpe d’Huez. The kilometres were gradually passing slower and slower, as if time and space were being stretched out the higher I went. I was still pedalling, but the finish was getting no closer and it soon became a case of not looking, just riding. The final push to the summit was pure evil, a real grind. I stopped once more to refuel. I have never drunk so much water in one day. I had another proud picture taken, pulled on my gilet and plunged down into the valley. What a descent. The first part was completed alone, but once on the main road at the bottom I was passed by a speeding rider. I jumped on his wheel, we caught a few others and a few caught us and soon we had a group flying along at 30-35mph. It was hot now, really hot and at this point my computer gave up and the screen went blank. I checked my watch to see how I was doing for time and the LCD screen was melting — I found out later it was 39 degrees in the valley. The descent was furious, hurtling through dimly lit tunnels with the transition from brilliant sunlight to pitch black on potholed roads at 35mph. The descent was bliss but had to finish sometime. Up until this point I had not really moaned, but my computer and watch had melted, my skin was starting to crisp, my hamstrings were incredibly tight and I started to fear cramp. Worst of all, my left foot was burning. What was happening? I was in a world of pain and at the base of one of the most feared climbs in cycling. Up until this point I had been riding for six and a half hours. I wanted to get up the Alpe in an hour and was not sure if that was possible. As others stopped at the base I rode on, to carry as much momentum as I could into the famous 21 hairpins. I clicked down straight back into the 25 sprocket and as if exiting hyperspace, the whole world came to a standstill. As I suspected after just a couple of hairpins I felt the first signs of cramp. I was drinking almost constantly and at every available opportunity grabbed more water. It was now not about finishing in a good time, it was just about finishing. I thought back to the prologue in London where I could have been standing watching the great race. But why stand around watching people race when you could come here and experience the pain yourself? It was about now I ceased to have fun and wanted it all to end. If time and space had slowed on the climb of the Galibier it had now ground to a halt on Alpe d’Huez. I reached back to my pockets for more sugar. In the morning I’d packed the day’s supplies into my jersey pockets with military precision, yet now seven hours later I reached back into a sticky overflowing mess. My hand stuck to three things and none were my sports beans. On the third attempt I eventually found them but couldn’t for the life of me open them. I figured I was using up more energy than they would give me, and put them back. Finally, the last few kilometres approached, the finish was in sight, so I ignored the cramp and attacked a couple of riders I’d been tailing for a while. I finished with a mixed sense of relief and joy. I stumbled over to the pasta bar, pulling out my free meal ticket which would have been in no worse condition had I regurgitated it. It was exchanged for a bowl of pasta and a glass of Coke. Then I just stood there, bike and Coke in one hand, pasta in the other, not really sure how to move or what to do next. But then there in front of me stood my wife and daughter. I was now a very happy man, it had taken seven hours 40 minutes and three seconds, and I loved every last bit of it. The plan is now to work out how to beat that time. I have 365 days to figure that out and I hope there’s nothing else planned for that day in a year’s time. Unlike the Etape du Tour, La Marmotte runs on the same course, roadworks permitting, every year. Long before sportives became as popular as they are now, riders have been testing themselves over this, possibly the toughest of all courses. In fact, so long as you know the roads, you could ride the Marmotte whenever you wanted. But you wouldn’t get free pasta upon finishing so I would recommend you ride the official event. I entered via the website www.sportcommunication.com. Sportcommunication runs a number of events throughout the year and a good ride in one will help you get a better start number in another. I left my entry quite late but unlike the bunfight/lottery involved in entering the Etape du Tour it was still possible to get a place with a late entry. I would also recommend looking at the website home.wanadoo.nl/halfjebruin/marmotte/, which is a one-stop resource containing links to websites ranging from previous results and first-hand rider accounts to virtual tours of the Alps, travel companies and accommodation. * Join the correct queue at the start. If you don’t you’ll just be sent right to the back while everybody laughs and points at you. * Eat and drink at every opportunity. I drank and ate far more than I would have on any ride I’d done before and I needed it. * Ride at your own pace. This is essential for survival. 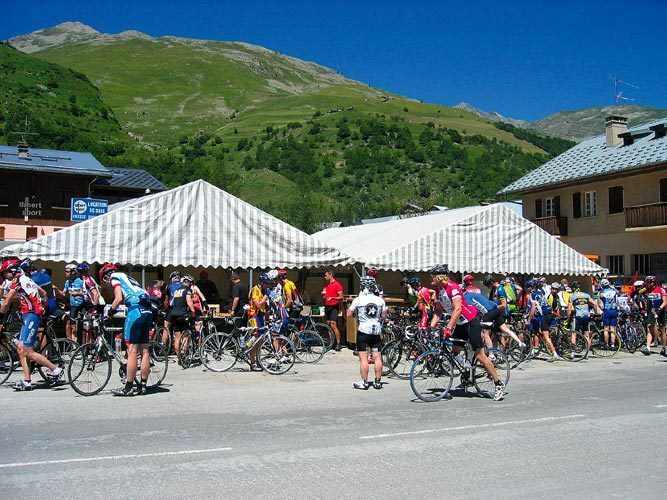 Leave the heroics for Alpe d’Huez as any over-exertion before this point will come back to bite you. * Fit a lower gear than you’ve ever used before. There’s noting macho about getting cramp and lying at the side of the road because you tried to do it on 42×21. * I would recommend having someone drive you down and arriving a day before the event. * Apply sun tan lotion and keep applying it.